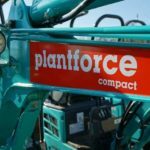 With special focus on the utilities, SME ground working and landscaping sectors which have also seen a massive growth in the South West over recent years, Plantforce Compact will now be offering a one stop shop which will include the “ready to go range”, teaming up with industry suppliers like Geith, Kobelco, Thwaites, Indespension, Daemo attachments, Ammann, Dieci, the new compact range will consist of excavators, dumpers, attachments and trailer packages backed by a small range of specific tools including hand held whacker plates and rollers, “everything a SME will need to get the job done”, one contract one supplier and as always a top notch service. We’re committed to offering our customers the widest choice of services and best customer experience possible. This includes providing the most advanced fleet of plant equipment, a diversely skilled workforce and supporting these with excellent customer service from the minute a client gets in touch.